The Moon is full in Leo, opposite the Sun in Aquarius. This Full Moon also starts an eclipse portal. A Lunar eclipse will happen within a few minutes of the Full Moon, and the portal will complete with a Solar eclipse at the next New Moon on February 26th. Question: How does this Full Moon and eclipse portal support the Heart? Summary: This Full Moon and eclipse portal offer support to the Will to Love. Through this support, a very stable, deep and abundant form of the Will to Love is accessible. This support can be tapped through feminine processes such as meditation, the recording of dreams, and/or rituals. The most timely channels for this resource are in the efforts the Heart makes to discover the holistic use of the sexual will in modern life, and in the ability to make clear, shrewd decisions in volatile situations in order to make a window for the nourishing presence of the Sun (Spirit and the Heart). The masteries begun in this work counterbalance the isolated stance modern society stands in while excluding from its essential understandings the holistic sexual will to create and the presence of nourishing divine light. Everyone is welcome to respond with questions and discussions. Question: How does the time of Capricorn support the Heart? Summary: Capricorn time supports steadfast progress towards goals of civilization and status, creative initiatives, instinctive decisions, and soulful prioritization of responsibilities. Images and stories associated with the constellation Capricornus date as far back as 4,500 years ago to the mid Bronze Age of ancient Mesopotamia. There, one of the oldest cities on Earth, Eridu, housed a shrine to the god Enki, whose widespread influence from Sumerian civilization was just beginning. This shrine was a ziggurat temple in the environment of watery marshlands of the river Euphrates. There, a god of running waters and deep underground aqua furs such as Enki would be integral to the society built on top of them. In time, Enki also became bestowed with the gifts of Me; the gods’ decrees for the establishment of civilization — a very structured, orderly, detailed domain. These two important but oddly dissimilar areas of responsibility gave rise to one of the visual representations of Enki as a mountain-sea goat. The head and torso of a mountain goat symbolize his “king of the mountain” duty to establish government and social structure, and the tail of the fish symbolizes his chosen abode of the running waters and the deep ground waters of the Euphrates environment. This hybrid image of Enki is immortalized in the constellation that we call Capricornus today. The god Cronus/Saturn from Greek/Roman mythology is the mundane and esoteric ruler of the Capricorn sign. This masculine god ruled during a mythological age that classical Greek/Roman civilizations called the Golden Age. In their version of the Golden Age, the Earth produced such an ample amount of resources, that mankind could live happily and peacefully on it without much effort at all. Thus, the god of that time kept up robust fertility and was associated with the same. During the Renaissance, another Orphic god Chronos became merged with Cronus, thus producing a “Father Time” character. When astrology references the activities of Saturn in a chart, the attributes of either the fertility god Cronus or the Orphic god Chronus may apply. As a mundane ruler of Capricorn, Saturn can teach lessons of limitations and generational struggles. As an esoteric ruler, he can give visions of harmony and balance to efforts in lawmaking and the evolution of society. Six cards in the Thoth deck reference Capricorn directly (click on card name below to view card). These cards, together with the exquisite rendering of Cronus/Saturn by Bee All Designs, form an altar at which the Heart can sit peacefully to reflect on taking responsibility for Capricorn work. In this image, themes of Enki the mountain-sea goat, Pan the half man, half goat and Capricorn’s ruling planet Saturn all capture the Capricorn theme of building civilization and values out of the set of traits common to human kind. To put the complexity of that task into perspective, in his work Saturnalia, Roman philosopher Macrobius Ambrosius Theodosius wrote, “Good laws are begot by bad morals.” The central figure is a mountain goat with three eyes. The “third-eye” symbolizes insight and wisdom, and the goat symbolizes instinctive nature and ego. The work is in merging these opposites. The winged, double-headed snake staff known as the caduceus comes from Mesopotamian mythology concurrent with Enki, and symbolizes the structuring of commerce and communications in civilized life. 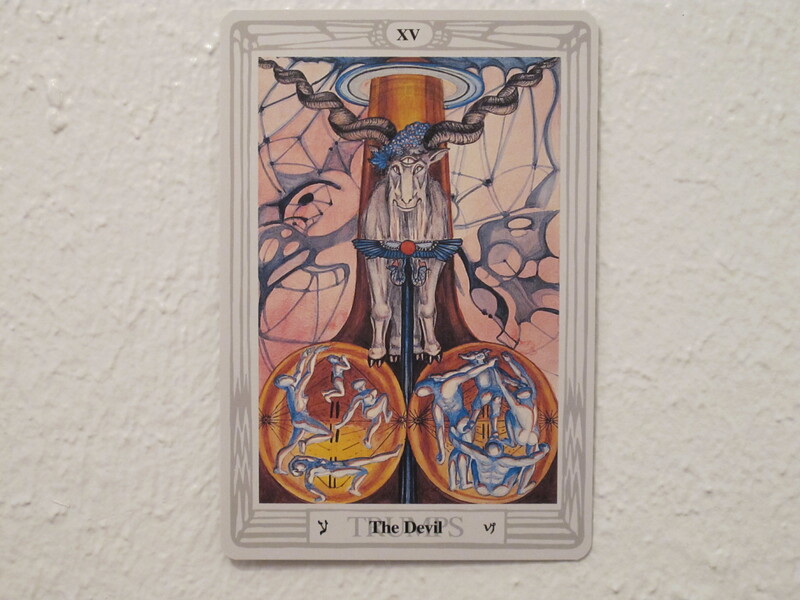 The presence of the large caduceus in this card moves the work of the three-eyed goat beyond the personal level to the societal level that Capricorn is concerned with. Although this card issues a tough order, the phallic symbol and god Pan come to the rescue to reveal resources for the task. The mythological half man/half goat Pan is shown with an erect phallus (Burt, 2002, p. 384). That phallus appears tree-like behind the goat in this image, with its tip penetrating Saturn’s rings (Snuffin, 2007, p. 58), and its testicles appearing below the goat’s feet, root-like, with masculine and feminine figures taking form within. In addition to the Saturn-crowned phallus’ reminder that masculine creativity absolutely can balance and transform civilization, its allusion to Pan also directs one towards the Earth to access that power. In myths, god Pan inhabits caves, grottoes and forests (Burt, 2002, p. 383). When the Heart is at one with nature, it can discover what it has to do about issues in the civilized world. Thus, “crazy ideas” to run off into nature and live rustically may actually be Capricorn impulses directing the Heart to enter the laboratory where deep thoughts for civilization can take form. 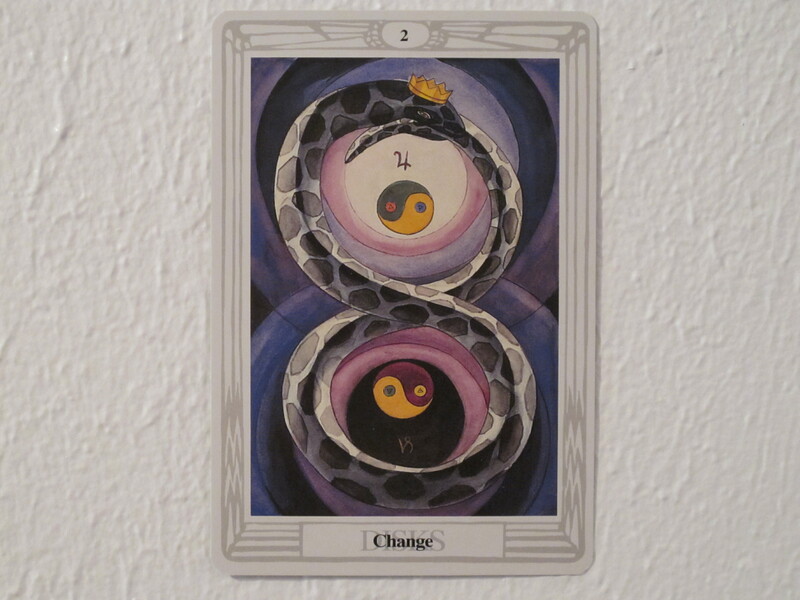 This card covers a time period of the zodiac wheel from 20° Capricorn to 20° Aquarius (DuQuette, 2003, p. 210). The image demonstrates Pan’s capricious creativity. The central figure prolifically begets the minor figures who draw the carriage forward. 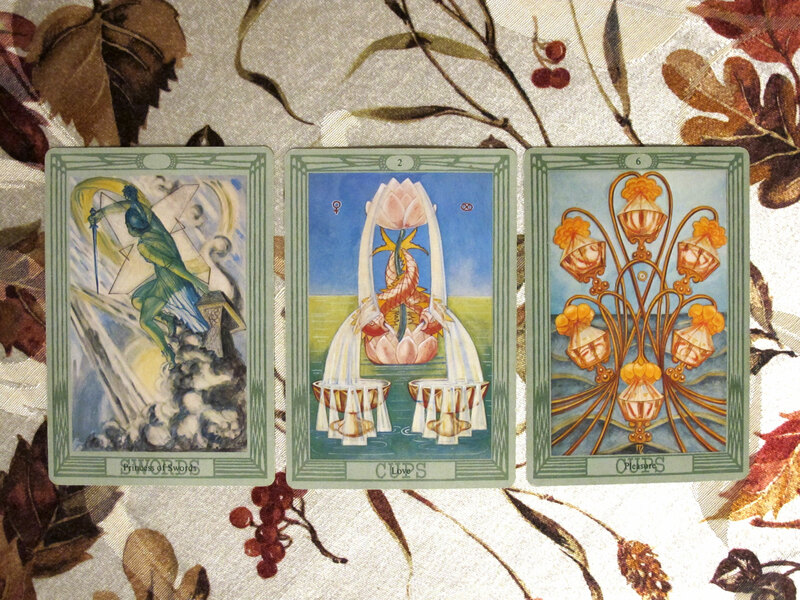 The minor figures resemble the human figures representing the growth of civilization in the Major Arcana XV card. However, the Prince quickly severs the reigns on those figures with his Sword. In other words, his attention cuts off and the figures develop of their own accord or not at all. Then he immediately repeats this impulsive process. Although the carriage moves forward, the extent of the motion is uncertain. This card reflects the Heart’s emerging courage to state its creative impulses and instincts, and the mind’s emerging ability to pay attention to and prioritize what the Heart has uttered. When this card appears, the horse and the driver are learning to move the carriage forward together. Thus, Prince of Swords work is a stepping stone to more substantial Capricorn work. 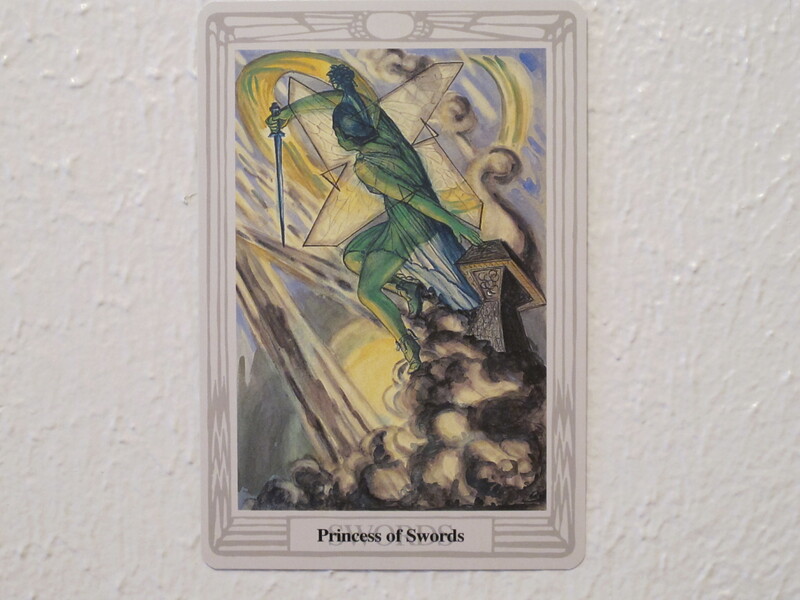 This card, together with the Ace of Swords, covers the signs of Capricorn, Aquarius and Pisces and rules the geographical region of the Americas (DuQuette, 2003, p. 172). The Princess of Swords wears the crest of the Medusa’s head (DuQuette, 2003, p. 196). Her power is to solidify what is volatile, and she can shrewdly nail down concepts of social change that swirl around in the mind, the way the founding fathers of the United States nailed down the US Constitution. She also has goat-like determination on the battlefield, even the battlefield within the Self. This princess picks up the sword and fights. On the altar of Capricorn, she supports solving problems in practical matters so that one’s personal life can be as much of a Golden Age as possible. The generational upheaval inherent in Cronus/Saturn mythology can suggest radical shifts. However, Zeus/Jupiter in Capricorn celebrates finding justice for all pairs of opposites. This is necessary for a civilization that takes all dispositions into consideration, in the sense that it steers away from ideals and makes plans for how human traits play out practically. In the image, the circular Uroboros snake eating its tail assumes the eternity symbol instead of the circular shape surrounding a lion’s head that it traditionally assumes in Mithrus symbolism, which migrated into Cronus/Saturn symbolism (Burt, 2002, p. 368). Nevertheless, the Uroboros still illustrates the natural devouring principal of life in the physical world. The old passes away and the new comes into being. The symbols of Yin-Yang further sanctify the wisdom of uniting opposite elements. On the altar of Capricorn, this card supports the Heart’s work to transform civilization in favor of a new, all embracing perspective. The will to lift up civilization to higher levels of power and consciousness draws on energy levels and priorities familiar to warriors. Accordingly, Ares/Mars in Capricorn packs the power. 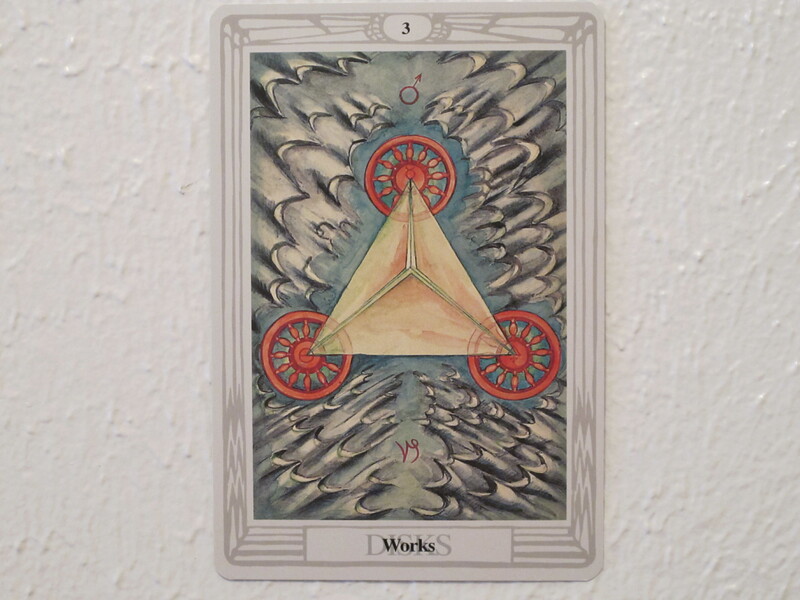 In the card’s image, three red wheels of Mars spin like aircraft propellers and lift the base of a pyramid through clouds into a clear blue sky. Furthermore, each propeller has a symbol of one of the three alchemical elements: salt, mercury and sulphur. A warrior with the will to transform society lifts all levels of that society up to a more balanced ground. In the solidity of that balance, there is power. This may sound like a tall order, and many historical and current leaders have made the attempt, however, the purpose of the image is to motivate the Heart to use its wisdom and passion as it decides how to play its role in any social change. This card shows the state of plain and simple earthly stability. In its simplicity, it understates how much power it took to bring the diversity of human traits to this stable point. In the image, the power of the Sun and no less pushed the task of transforming civilization over a long bridge, out of disorder and into a strong fortress designed in square patterns and symbols of each earth element on the four square watch towers. 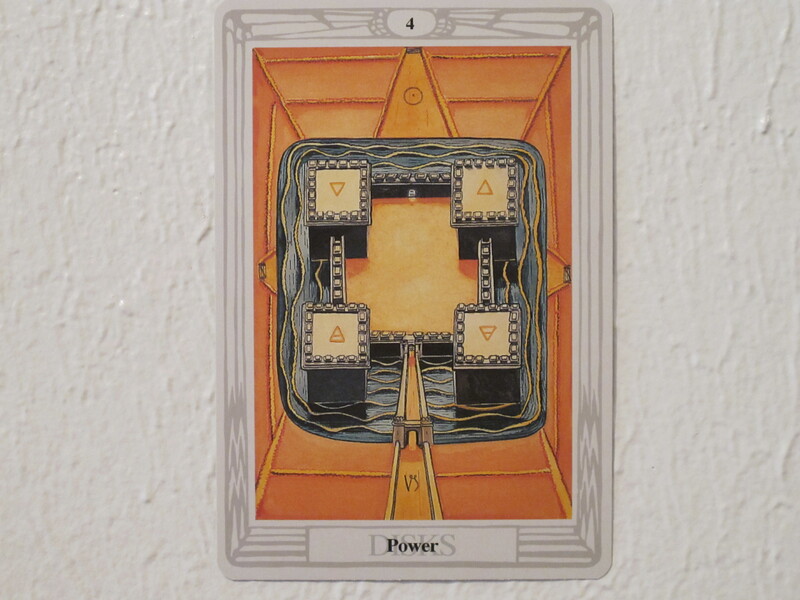 When the Heart comes to the altar of Capricorn, this card can reflect to the Heart its connection to infinite energy available to restore order to and protect civic components that were in danger of disappearing. May the Heart move from the altar of reflection to applying Capricorn themes in life with courage and inspiration. As the Heart co-creates civilization day by day, may it find the way back to the timeless support that many Hearts knew across civilizations and time. May this journey display the Heart’s gifts and fill it with joy. May it be so for you, dear reader. May it be so for me. May it be so for all the Hearts in the world who hear the call to make their unique contributions to the world before they reach the mirror of the grave. Please share your experiences in the comments section as you work with masculine creativity, creative impulses, life-changing impulses, making visions practical in your family or community, or finding time for many important responsibilities. Michelle Biyal is a San Francisco artist and a partner of the entrepreneurial business Beeall Designs. Through Beeall Designs, Ms. Biyal sells bees wax candles that she makes using commercial molds and molds of her own design. In 2014, Ms. Biyal was commissioned to make oak stick candles (click here to see them) for the Oakland Museum of California. Ms. Biyal’s beautiful candles and artwork are displayed in her website BeeallDesigns.com (click here to visit). Burt, K. (2002 ). Archetypes of the zodiac. St. Paul, Minnesota: Llewellyn Worldwide. DuQuette, L. M. (2003). 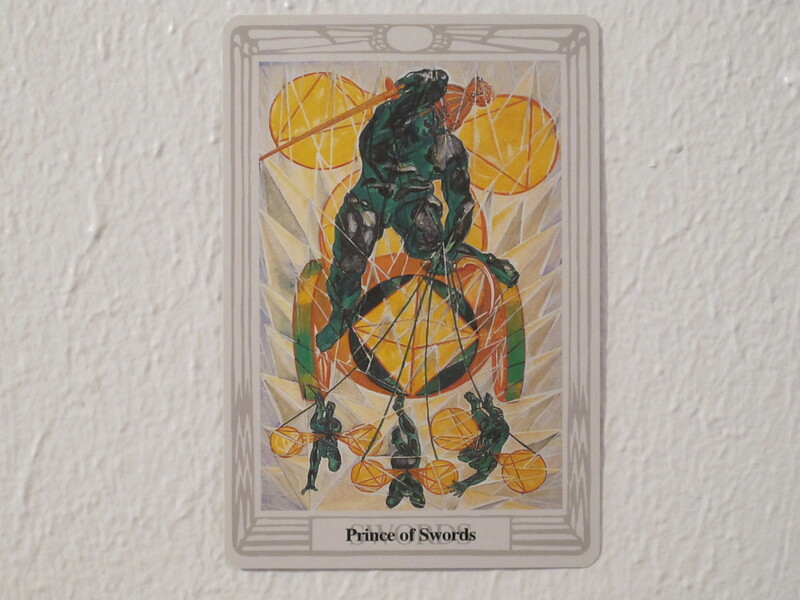 Understanding Aleister Crowley’s Thoth tarot. San Francisco, California: Red Wheel/Weiser, LLC. Snuffin, M. O. (2007). The Thoth companion. Woodbury, Minnesota: Llewellyn Publications.